North Korean leader Kim Jong Un met with South Korean President Moon Jae-in April 27 in the Demilitarized Zone at Panmunjom. Their discussions centered around the denuclearization of the Korean peninsula and a peace settlement. North Korean leader Kim Jong Un (2nd-R) talks with South Korean President Moon Jae-in (2nd-L) during a meeting at the border village of Panmunjom in Demilitarized Zone, April 27, 2018. The Trump administration appears to be satisfied with the results of the meeting, believing it paved the way for the coming U.S.-North Korea summit and leaving room for U.S. President Donald Trump to pursue the specific measures he wants. It appeared that inter-Korean reconciliation was not aimed at resuming large-scale economic projects between the two sides, but rather, to focus on reducing military tensions, addressing humanitarian needs in the North, and people-to-people exchanges. This shows that Seoul, at least for now, is trying to reconcile with Pyongyang without undermining international sanctions against the North. Before the summit, Moon repeatedly said the resolution of the nuclear issue would be key to meaningful progress in Seoul's relations with Pyongyang. Seoul, however, is likely to embark on ambitious economic projects with Pyongyang once the nuclear issue is resolved and sanctions are lifted. 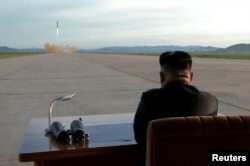 FILE - North Korean leader Kim Jong Un watches the launch of a Hwasong-12 missile in this undated photo released by North Korea's Korean Central News Agency (KCNA). The North vowed to work toward "complete denuclearization" of the Korean peninsula. Critics in Washington say that commitment lacks specifics. Some point out that the North's interpretation of the peninsula's denuclearization might be different from that of Washington, saying Pyongyang often demanded the United States withdraw its forces from South Korea and remove its nuclear umbrella from the South in return for the North giving up its nuclear weapons. Moon's supporters in Seoul maintain that persuading Kim to put his verbal commitment to denuclearization into writing was the goal of the summit, and the goal was achieved. They argued that specific measures of denuclearization need to be worked out between Trump and Kim at the planned summit. Whether Moon intended it or not, the outcome of the inter-Korean summit could put a strain on relations between Washington and Seoul. For example, Moon and Kim agreed to "completely cease all hostile acts against each other in every domain," which could give Pyongyang an excuse to demand the suspension of joint military drills between the U.S. and South Korea. Some Washington experts found the agreement too vague and warned that it could result in sweeping consequences. The inter-Korean agreement also could have some negative implications for the overall future of the U.S.-ROK alliance. For many decades, deterrence against threats from North Korea through combined forces of the U.S. and South Korea has been the cornerstone of the alliance. As the two Koreas move closer to eachother and tension eases, the value of the U.S.-ROK alliance will begin to decrease. Some in Washington remain skeptical Kim will denuclearize, believing his motivation for the peace offensive is to drive a wedge between Washington and Seoul. North Korean leader Kim Jong Un is seen at Peace House of the border village of Panmunjom in the Demilitarized Zone, South Korea, April 27, 2018. 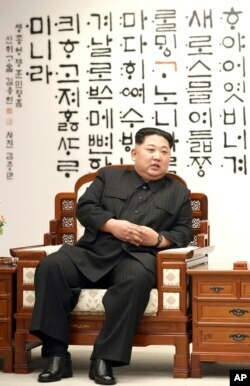 - Kim's move is a show of confidence in his position on the nuclear issue. In November 2017, he declared the completion of the country's nuclear force after the successful launch of an ICBM. Experts who believe this theory are highly skeptical of Kim's pledge to denuclearize. - Kim has come to grips with the reality that he must denuclearize to survive as his regime is feeling pain from international pressure. Some Washington experts questioned when and how Kim would deliver his peace offensive toward the world to his own citizens. During his meeting with Moon, Pyongyang launched a massive media campaign to get its version of the story out. North Korea's official newspaper Rodong Sinmun ran a front-page story on the summit headlined, "a historic meeting that opened a new era of national reconciliation, unity, peace, and prosperity." Kim and Moon said they would pursue talks with the U.S. and China to formally end the Korean War, which ended in 1953 with a truce but not total peace.